A three week inquest into the death of a Luton pensioner is to be held in June next year. Leonard Flower died at his home on October 22 2013 after being stabbed by neighbour Sameer Babar who had severe mental health issues. A serious case review after the attack on the 67-year-old found that the death could have been prevented if local agencies had worked together. Babar is now sectioned under the mental health act. 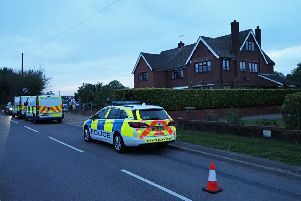 At a pre inquest review at Ampthill on Thursday Bedfordshire and Luton coroner Tom Osborne said he believed there was sufficient reason for resuming an inquest into Mr Flower’s death, which occurred in the garage at his home in Carnegie Gardens in Luton. He ordered that all statements, notes, individual management reviews and documents pertaining to the case from all the agencies involved, including Beds Police, SEPT, and Luton Borough Council should be supplied to the coroner’s office by September 9 along with any representations and objections to any further disclosures. A further review will be held on November 17 before the main inquest next year. In the serious case review issued last year it was found agencies’ “failure to share information... was a significant factor in the tragedy”.